I haven’t read through all the replies to your question about seasoning, so I’ll just put my 2 cents in. If you’re cooking your seasoning coatings of oil at 400 for an hour, I think the problem is that you are over doing it and incinerating the oil instead of cooking it on. I tend to agree. 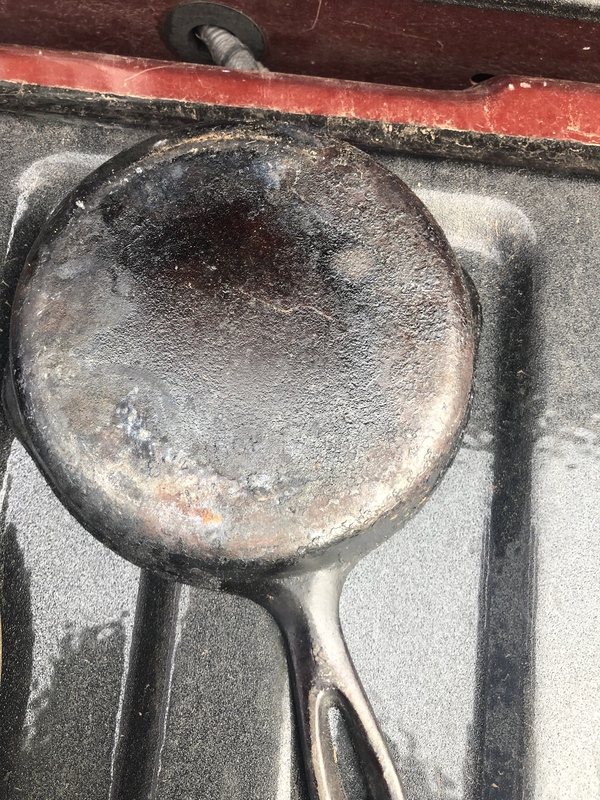 I actually need to strip and reseason my old Lodge skillet I've had for probably 20 years - it's getting a little too crusty/carbonized. I had a beautiful Wagner that was smooth as glass and the ultimate egg pan, but gave it to a friend when I moved as it had the lip around the bottom (great on gas) and wouldn't work on my ceramic top stove. Anyway, I just use Crisco and the oven at 350 to 375. If it smells like the oil is burning, I turn it down. The trick is to "cure" the oil, not carbonize it. My favorite use for the skillet? Hamburgers on the grill. Yes, yes! I have a Weber Performer charcoal grill and place the charcoal in the little baskets used for indirect cooking right in the middle of the grill. Skillet goes on top for about 10 minutes to preheat and about 4 minutes per side and you've got the best hamburgers ever. Juicy, perfectly done and with a nice brown crust with tons of flavor. It makes a helluva mess but keeping the lid partially closed keeps it under control. I won't fry hamburgers indoors, even with a good range hood that vents outside, due to the mess and having the house smell like fried meat for 3 days.... but off the iron pan on the grill....MMMMMM! 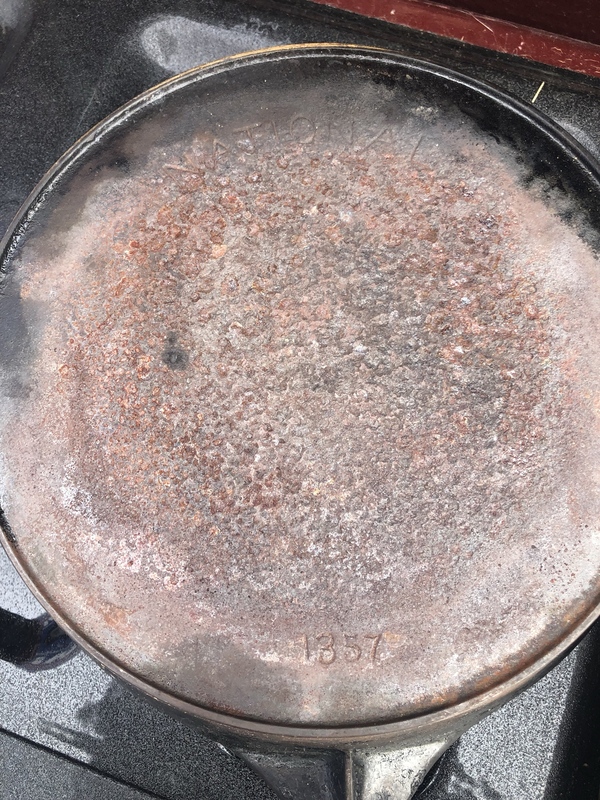 A friend of mine had her new boyfriend ruin the seasoning on her mom's antique Wagner pan by leaving it submerged in the sink. (he didn't know). I am going to help her clean and re-season it. Since I am planning to do this, I pulled my dads old unmarked 10-1/2 Wagner Skillet, and my mother In laws 8" Wagner out of the cabinet, and I think I am going to re-season my dads at the same time. The cooking surface is great, but there is a decent quantity of lumpy carbon on the bottom. I know I'll need to strip my freind's pan, but should I just clean the outside of mine, or do the whole pan? Has anyone had any experience with the Carbon Steel skillets? I am looking at one like this. Actually, the practice of exceeding the smoke point in the seasoning process is required to polymerizing the oil. Chip, I'm the type that likes it all to look nice and even, so I would strip the entire pan. I picked up 3 skillets on Sat at the Goodwill bins. They were about $6-7 ea (pay by the pound). 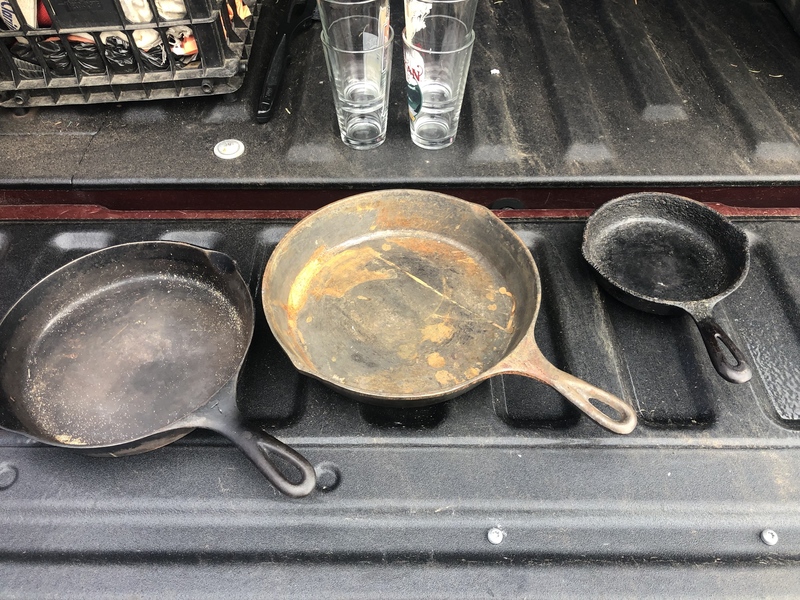 A 8.5" unmarked post-1960 (probably Wagner), a #7 Wagner National (1930-40), and a 10.5" Lodge (1980's). All are very smooth, even the newer Lodge. I strip them in a lye bath so it's easy to do several at a time and strip the whole pan. Seasoning 3 at a time isn't much more work than doing one of them. Carbon Steel Skillets treated, much the same as Cast Iron. Lighter weight, don't hold the heat as long but heat up quick. I like them for frying fish as they don't absorb the fish odor as much as the CI. I have several. I tend to have purpose specific pans. Dummy me! Maybe I just like collecting skillets. Pateco, why would leaving it in water ruin the seasoning?? He left it overnight in soapy water, and the seasoning broke down. Found this at the local swap meet this weekend! I’ve never seen one before so I’m pretty interested in finding out more about it! I have lots of cast iron and several Dutch ovens but nothing like this. Never seen a dutch oven with a handle. Normally they have a bail handle. It's made for camp fires. The legs hold it over coals, and the rim on the lid hold coals as well. Any markings on the bottom? 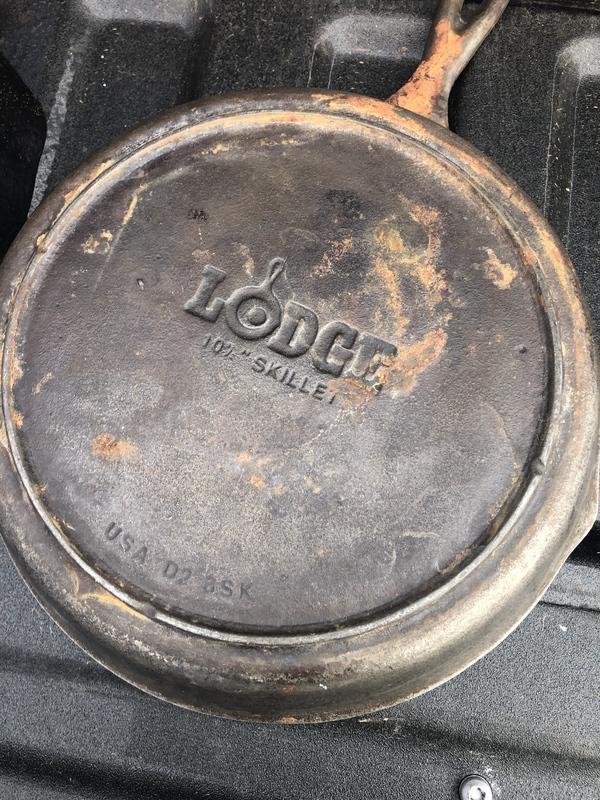 I snagged the pics and asked over in Cast Iron Collector Forum. We'll see if they know. Foreign or domestic, I would say pre 1960. Congress passed a law in 1960 requiring a marking of the country of manufacture. It is definitely cool. De-rusting may show other markings.
. My wife had a bad habit of grabbing a CI pan, turning the burner to high, and throwing something in. Keep at it, keep heat down! I have been married 26 years (but it seems like only 25 3/4) and this, as well as putting cast iron in the dishwasher has been a strain on the marriage. 2. After it has gotten hot and is smoking and most of the oil has gone away or turned into a shiny waxy subsatance, wipe it with a paper towel soaked, but squeezed out, with oil. This will start to smoke right away, let that cook a few minutes. What is going on here is that you are sort of distilling the oil and you want sort of a tough wax left behind, but not too much. But as majicwrench and other have said preheat. Pithy saying wanted- will pay cash for wit. What your doing with seasoning is using heat to polymerize the thin coat of oil into a hard stable polymer coating. There is still a lot of arguing going on as to what exactly happens chemically. and how that relates to oil choice, and seasoning temperature. Lots of science involved. I can't be bothered. Cook, eat, cook, eat, cook , eat, cook, etc.......is the method I use and enjoy. I'm almost blinded by all that science. I read that entire page, and I'm a bit dizzy from it. Oh, and that's one of the nicer things I've heard about Sheryl Cantor. I think I am going to try Canola oil, and a combination of several of the seasoning methods I have seen on YouTube. I guess you use what works...but if you use higher smoke point oils, there's no reason you can't do it in the oven. No smoke and smell. Check out refined peanut oil. Organic, GMO-free and there are no allergens left in it so you don't need to worry about people with peanut allergies. Leaves a nice hard grey seasoning. A well seasoned pan does not need to be coal-black. i reheat the pan on the stove and oil again before next use normally. Not looking for anything. I have too much already, my wife says. I like science, but I agree. My favorite skillets are my Griswolds, my Waldron Copper, and an ancient professional kitchen anodized aluminum 14" skillet. Oh, and my spun-steel wok. All are seasoned from many years of use and some abuse. Even the aluminum has a thick black crust of seasoning. My go-to oils are grapeseed when I need hot--it has a very high smoke point--butter for not-so-hot, and bacon fat. Because, well, bacon. I don't hesitate to cook tomato-based sauces in my big Gris. I just clean it and heat it with some oil when I'm done. When I was on my pancake kick back in my late twenties, I had a dedicated CI griddle that I seasoned with bee's wax. Some older friend turned me onto this trick. That griddle--one of the round ones with a handle--was absolutely non-stick for pancakes, biscuits, bread, etc. I could easily flip a pancake by tossing it, and often catch it on the griddle again! But any meat would stick like a magnet and require stripping and re-seasoning. I'm wondering what ever happened to that griddle? Too many years living in shared housing, I guess. I cook with cast iron about once a week, and keep in mind I usually only cook breakfast things but I never have sticking issues. The things I cook are diced potatoes (fried in a thin layer of olive oil, but even when the oil is cooked up they never stick) and sausage links, which are naturally greasy. Bacon ... lots of grease. Before cooking scrambled eggs I throw in a lot of butter, never have issues with sticking. After the meal I heat the cast iron on the stove then put it under hot tap water and scrape any remaining residue off which isn't much, if any. I then pat it dry with a lint-free towel and put it on the stove to warm and rub it down with olive oil. I never do anything different and my pans never have sticking issues, they're put away black and shiny. Like a previous post said, oil or grease first. Sidenote -- last week I used a new cast iron flat pan to make pancakes, and I only seasoned it once. I used butter for the flapjacks and there was no sticking. Chip, I'm the type that likes it all to look nice and even, so I would strip the entire pan. I strip them in a lye bath so it's easy to do several at a time and strip the whole pan. Seasoning 3 at a time isn't much more work than doing one of them. So I did four pans this weekend. 2 Wagner #8, a Wagner #5 and a Modern Lodge #8 with a sanded and polished interior. Here is what they looked like to start. I Stripped them in the Self Cleaning Oven. I then Washed each one with Soap and water, Dried in the oven at 200° and oiled with a light coat Organic Flax Oil. Then reheated them to 200° for 15 minutes, and wiped off any excess oil with a dry cloth. The preheat to 200°, oil, 15 minutes more at 200° wiped down, 1.5 hours at 500°, and then cool for 3 hours was repeated 5 more times for a total of 6 coats of seasoning. Below pics are after I was done. The Modern Lodge with the pollished bottom turned out super smooth and glossy. I am really pleased with most of the results. The Wagner #8 belonging to my friend however was a different story. It started out with some sort of damage, and did not take the seasoning well at all. Here it is after the first coat. You can see the discolored area on the top right half of the pan. Below is after all 6 coats. Most of the pan seasoned excellently, however that section looks like crap. Any Ideas what happened to this pan to cause this? They are $3-$5 at your local restaurant supply, or Smart&Final. This is a stiff-stiff-stiff spat - probably 0.050 thick stainless. I have four of them, the oldest is about twenty years of age and the only wear it shows is that the corners haven't rounded off equally. I'm turning Lampanese, I think I'm turning Lampanese, I really think so! I'm impressed with that newer Lodge. Your hard work shows. As for the Wagner, did it get the same lye bath? Cause that should have taken care of it. No Lye bath, these were stripped in the self cleaning oven. Try stripping it with lye. It may be something that won't come off in a self cleaning oven. Cast iron cookware is the traditional choice for cooking over wood fire; it distributes heat evenly over cook surfaces, becomes easier to use as it seasons, and is very rugged. But personally I would recommend stainless steel cookware for backpacking (more here), other metals work also, each have their pros and cons, it really just boils down to personal preference in the end. That Wagner looks like it has rust damage, pitting. It looks like it was abandoned in a back shed or barn, sitting at an angle, and rain collected in it. The good part is beyond the high tide line. Tha one might have to be a wall hanger unless you can regrind the inside. I have a lot of cast iron to say the least. I use an electrolysis tank, sanding, and good ol' Crisco. A couple of good coating sessions and many pounds of bacon later they are basically non-stick. I really dislike using lye or oven cleaner to scour my pans if I find a rusty one for sale. Just remember that acid foods like maters will remove the seasoning quick and with a vengeance. 2) Cast iron hurries for no one. If you want food faster you should have et' before you got here. I'm not a collector. I just own many versions of the same item. With a lot of sanding (by hand or machine), you can have a smooth pan. When I was in high school i worked at a restaurant for a couple years. The head chef showed me a way to season a pan i still use to this day. My wife and I only use cast iron, food just taste better in cast iron. I season my cast iron with Crisco in the oven at 400 degrees for a coup!e of hours then turn off the oven and leave the pan in over night upside down to cool. Owen the head chef would heat up his pan with a little oil until it started to smoke then run the pan under running water to cool it down then put it back on the stove and cook. It sounds crazy but it works awesome.